There are some incredibly talented bakers and cake decorators in a group I run on Facebook called ‘Hello Cuppies Baking Buddies‘ (cheesy name, I know). Wanting to help share their talent was how these Meet the Baker blog posts started last year. Every person/baker has their own story to tell and they also offer some really useful advice too. It’s incredibly inspiring and I love reading about other people’s backgrounds and reasons for doing what they do. Where did your Cake Company name come from? Cakes by Leisa – It’s not very original, at the time I didn’t really think it would go anywhere so didn’t bother thinking of anything different, now I wish I had!! When did you start your cake business and why? I was made redundant when I was pregnant with my now 4-year-old, I had a year’s maternity leave then decided to give it a go, I went to loads of classes and learnt as much as possible and I’ve been going properly for just over 2 years. 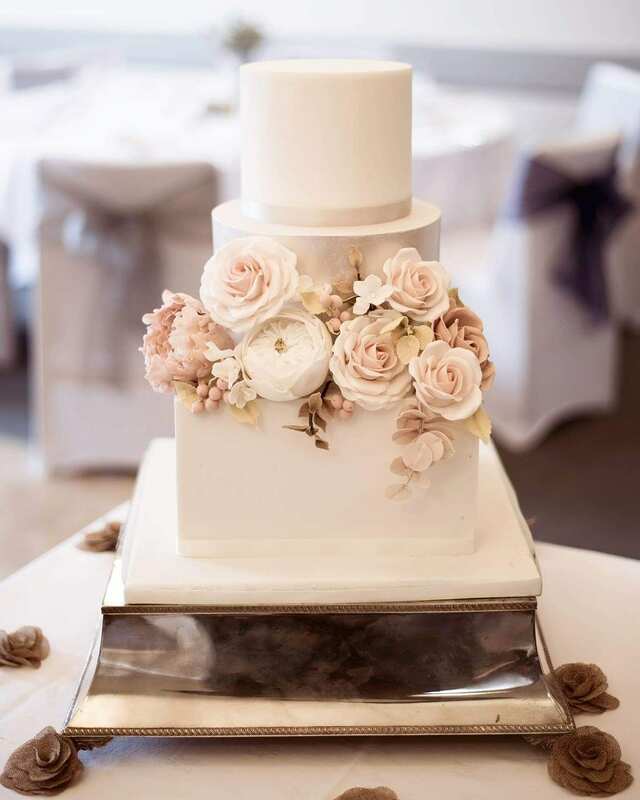 I am located in West Yorkshire but cover all of Yorkshire and sometimes further afield for wedding cakes. Do you have a particular favourite style/technique? Making sugar flowers!!! I could literally just do that all the time and id be happy! What was your first ever paid order? I think it was a giant cupcake for someone I used to work with. I get inspiration from lots of things…flowers mainly. Do you have a favourite cake/cupcake flavour? At the moment its s’mores but it changes weekly. I just like all cake! Cake tool you couldn’t live without? Profroster! Its a game changer! Hopefully with a busy wedding diary and still improving and learning as much as possible! What is your favourite thing about cake decorating? Least favourite is actually baking the cakes, I could do without that. My favourite part is making sugar flowers. Who is your go-to cake decorating supplies shop/website? I buy the majority of bits from my local cake supply shop, The Bakers Cupboard in Batley and then online from Cake Stuff. Top business tip for making what you do a success? Self-promotion and marketing. I didn’t think I’d be that good at that part of it but I seem to be doing OK. Social media has probably been the most important tool in moving my business forward. Any words of advice for cake decorating beginners? Just learn as much as you can, whether its via YouTube or going to classes, you never stop learning! My favourites are Dominique at Poppy Pickerings and Suzanne at the Frostery. Best bud or go-to cake friend in the caking industry? Two of my local cake friends are Vicky from Strawberry Fields Bakes and Emma from the Cake Illustrator. What’s been your favourite cake/cupcake order to date? It’s hard to narrow it down, but one I was most proud of is a 7 tier wedding cake that I recently delivered 4 hours away to London! Have you had any cake fails so far? Luckily not too many but I think everyone has at least one!!! What is your biggest business hope, dream or ambition? I would eventually like to open my own studio away from home for caking and teaching. What do you do when you’re not cake making? I play cornet in a brass band in my ‘spare‘ time. I’m scared of escalators, most people are scared of lifts but I’d choose that any day over an escalator. "The Best Chocolate Cupcake Recipe"